Coniston is a lovely little village close to the northern end of Coniston Water in the Furness area of Cumbria and located in the southern part of the Lake District National Park and also within the boundaries of Lancashire. The village consists of the Ruskin Museum, a Tourist Information Centre, a variety of shops, post office, spar shop, cafes, tea rooms and four pubs The Sun, The Crown Inn, The Yewdale Hotel and The Black Bull Inn and Hotel. There are also two Youth Hostels one on the edge of the village and the other in the nearby Coppermines Valley. 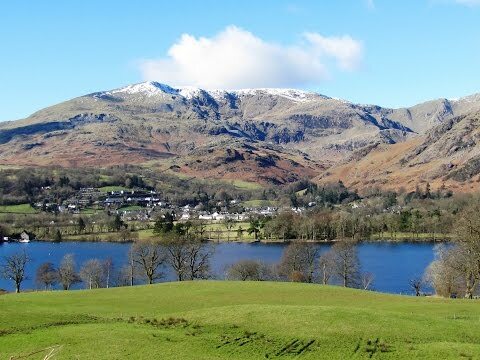 Coniston is and grew as both a farming community and to serve local copper and slate mines. It was a scattered rural community until the copper mines, dating from Jacobean times, were revitalised about 1859. The village grew mainly around Coniston Hall, a 16th century farmhouse with massive chimneys, built by the Fleming family which is now owned by the National Trust. Two of Coniston’s volcanic slate quarries are still operating one in Coppermine’s Valley being blue slate and the other at Bursting Stone on the east side of the Old Man of Coniston being light green slate. In the Victorian times Coniston became popular with tourists partly due to the construction of a branch of the Furness Railway which opened to passengers in 1859 and terminated at Coniston railway station. The creation of the national park in the 1950’s provided a further boost to tourism and so did John Ruskin, artist, writer, critic, teacher and philosopher, who bought and lived in Brantwood House on the eastern side of Coniston Water from 1872 until his death in 1900 is buried in Coniston village churchyard of St Andrews. The museum in Coniston village is dedicated to Ruskin and also covers the history and heritage of Coniston Water and the Lake District. Arthur Ransom, novelist, gained much of his inspiration for his children’s novel ‘Swallows and Amazons’ from Coniston Water. The water has become known for a controversial murder case. Mrs Carol Park was dubbed the ‘Lady in the Lake’ after the Raymond Chandler novel of the same name. Brantwood built in 1797 was a very cold, damp and decayed cottage when John Ruskin bought it for £1500. He transformed it into a magnificent mansion that commands one of the finest views in the Lake District. The mansion, now set in extensive grounds, is now a study centre which keeps alive the Ruskin tradition. Visitors can admire his art treasures and also examine his books, manuscripts and original drawings. He was very popular around Coniston village and took a great interest in all aspects of community life. He loved the Lake District so much that when the time came he declined a place in Westminster Abbey preferring to be buried in the churchyard in Coniston. We turn right out of the car park and follow the road for about 50 yards to the right hand bend then turn left at the public footpath sign. We follow the path to pass through a swing gate then bear left to go through another swing gate into the trees. We follow the path soon going up some stone steps then up some wood and turf steps. At a junction we bear right uphill to the top of some stone steps. We go down the steps and turn left onto a driveway then turn right onto a grassy path, signposted East of Lake Road. We go through a gate onto a tarmac lane and turn right for about ½ mile. At the y-junction we bear left following the signpost for Brantwood. After about 600 yards at the start of the wood we turn left through the gate and follow the bridleway. We pass through a gate, cross over a stream and bear sharp right. We continue forward passing a gate for Brantwood in the wall on our right. We pass a shelter and a barn on our right and keep heading forwards. We cross over a wooden bridge, pass through an iron gate then head uphill to go through another wooden gate. At the wide forest track we turn right passing Grisedale Arts at Lawson Park Farm. We keep heading forwards following the track and at the y-junction we bear right. We head forwards and keep following the track round to the right on the u-bend, we now head downhill to the road. At the road we turn right and follow the road with Coniston Lake on our left. We pass a car park and picnic area and soon arrive at Brantwood. We then continue on the road for about ½ mile and after passing Thurston Outdoor Education we turn left through a swing gate signposted Public Bridleway into a field. We bear right following the post to the corner of the hedge and follow the path bearing right to the right of some white buildings to a gate with a yellow arrow. We go through the gate and cross straight over the lane through the gate opposite into the field and turn left following the hedge on our left. We bear left to the corner of the field go through the gate and head forwards through another gate. In the next field we bear left downhill to go through the gate that leads us back to the road. We turn left and make our way back to the car park. This is an easy walk on good paths, tracks and minor tarmac road with a few inclines and declines. There are also some steps up and down. Approx 6 miles allow 2½ – 3 hours using OS Explorer Map OL7, The English Lakes South-eastern area. This walk is clockwise. Start point: Monk Coniston Car Park situated at the head of Coniston Lake 1 mile east of Coniston village. Pay and Display. From the A66 at Threlkeld take the B5322 on the left. At the t-junction at Legburthwaite turn left onto the A591 by the side of Thirlmere. At Ambleside take A593 following the signs for Coniston. In Coniston turn left at the church and follow the B5285 past the Waterhead Hotel. Keep right at the y-junction the car park is on the left. Parking is £7.00 for all day. Parking: Monk Coniston Pay and Display Car Park situated at the head of Coniston Lake. There is a free parking area at Kye Wood and a free car park and picnic area south of Brantwood. There are public toilets in the pay and display car park next to the Tourist Information Centre in Coniston village. For refreshments there are a number of shops, cafes, restaurants and four pubs.